Greetings friends and fellow crafters, LeeAnn here with my contribution to the Joy Clair Patriotic Blog Hop. I chose to use images from both sets the Flag and the 4th of July to complete this banner which is now hanging on the inside of our front door for all to see that drives past. To complete this project I stamped the flag 3 times using my stamp positioner so that I could restamp as needed to give good coverage. This is a big 4x6 stamp so that made life a bit easier having the positioner so that it would restamp in the same place each time. 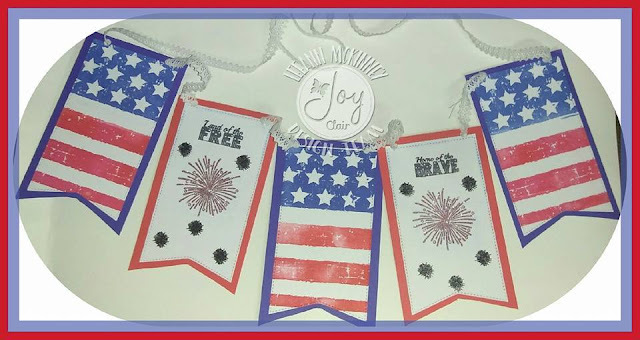 I then cleaned up my mess and started with the 4th of July stamp set, and stamped the larger Firework first and used WOW embossing powder and heat set it. I then stamped the smaller fireworks and heat set them with Silver embossing powder. I followed that with stamping the sentiments using Black Onyx Versafine Ink. Once I was sure everything was dry I used a tag die to cut out the banner images I had stamped, and then used my paper trimmer to cut the backgrounds a 1/4 inch larger all around. I used my hole punch to make 2 holes in each panel and strung it with some white ribbon lace. I hope you have enjoyed this project, be sure to hop along and see the rest of the teams projects and how they made them. Leave a comment on each blog and you will be eligible for a $25 gift card Joy Clair Gift Card. Here is our LINE UP for this hop. If you came from Donna's blog you are in the right place, If you are starting here, please be sure to start at the beginning with the Joy Clair Blog so you hop to all the posts. 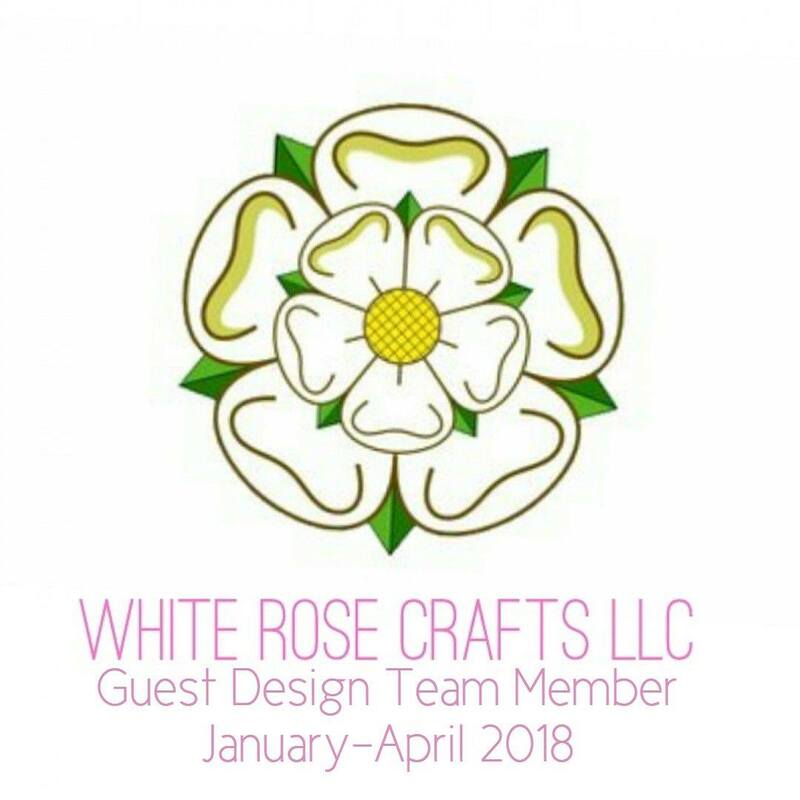 Steph is up next with a great project for you, please again be sure to comment on each blog to be entered to with the $25 Joy Clair Gift Card. Thanks for hopping, have a crafty day. I absolutely LOVE your Patriotic Banner LeeAnn!! I just may have to make one for my house this year for the 4th!! Awesome banner! 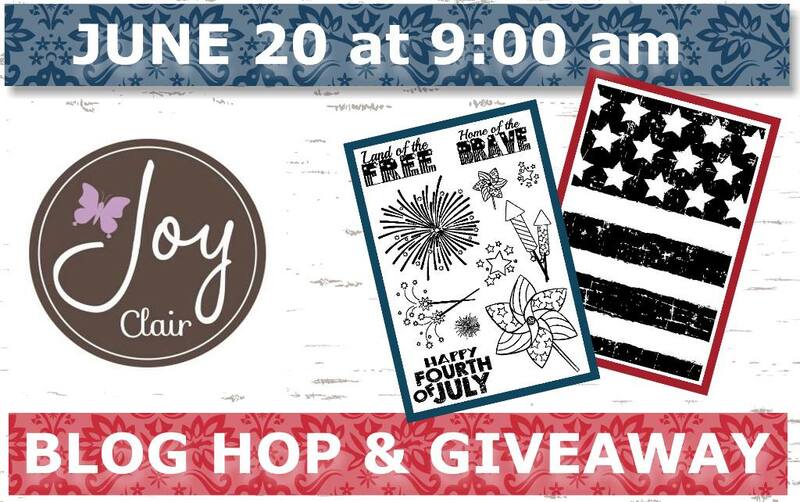 I really love that flag background stamp... great design! The new sets are great! LeeAnn love your banner! Perfect to display during the month of July for Independence Day! What a clever idea. I like to make something for the 4th too. This is great. Wonderful banner. Thanks for a great creative idea. what a great banner! so pretty! I like your patriotic banner. What a fun banner you made to display!! I think you did a great job on this banner! It would be a great decoration!